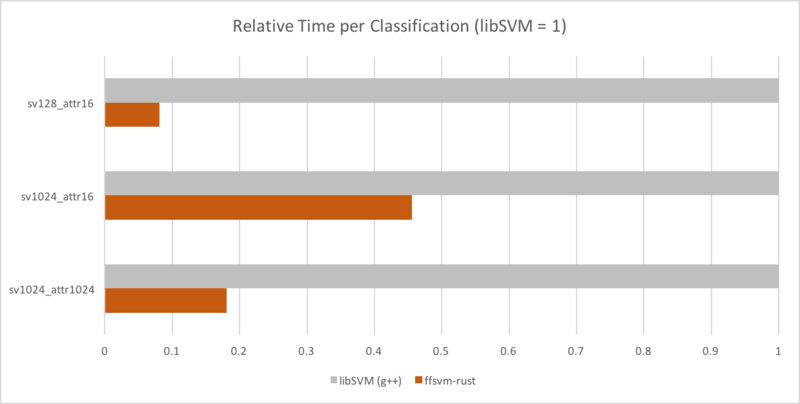 You trained a SVM using libSVM, now you want the highest possible performance during (real-time) classification, like games or VR. Note: Currently requires Rust nightly (March 2019 and later), because we depend on RFC 2366 (portable SIMD). Once that stabilizes we'll also go stable. Train with libSVM (e.g., using the tool svm-train), then classify with ffsvm-rust. // Replace `SAMPLE_MODEL` with a `&str` to your model. March 10, 2019: As soon as we can move away from nightly we'll go beta. Aug 5, 2018: Still in alpha, but finally on crates.io. May 27, 2018: We're in alpha. Successfully used internally on Windows, Mac, Android and Linux on various machines and devices. Once SIMD stabilizes and we can cross-compile to WASM we'll move to beta. December 16, 2017: We're in pre-alpha. It will probably not even work on your machine. Classification time vs. libSVM for dense models. All performance numbers reported for the DenseSVM. We also have support for SparseSVMs, which are slower for "mostly dense" models, and faster for "mostly sparse" models (and generally on the performance level of libSVM). For a ~50% performance boost consider compiling your application with more aggressive CPU flags (e.g., export RUSTFLAGS="-C target-feature=+avx2" in case you run on a modern x86 CPU). For a further x-fold performance increase, create a number of Problem structures, and process them with Rayon's par_iter.